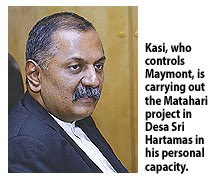 MAYMONT Development Sdn Bhd, controlled by property tycoon Datuk P. Kasi, is confident that its RM700 million luxury super condominium project, Matahari, will be fully taken up by the end of the year. The 158 units of the project in Desa Sri Hartamas, Kuala Lumpur, are being marketed as "bungalows in the sky". Prices range from RM3.1 million to RM10.8 million per unit. "So far, we've sold 43 per cent of the total units," Maymont head of sales Prabu Ananthan told a media briefing in Kuala Lumpur yesterday. "With the Chinese New Year break and the (property) market picking up, we are confident of selling all units by the year-end," he said. The developer expects annual rental yield of 6 per cent per condominium unit, with the superior units' targeted rentals ranging between RM16,000 and 18,000 a month. On why the project was halted after construction started in 2007, Prabu said it was part of the company's strategic effort to market the Matahari units "at the right time". Maymont head of marketing Chelvi Ananthan said the project was 35 per cent complete and the handover of the first phase, comprising 30 units, was scheduled for 2012. Kasi is the landowner of the 2ha freehold tract. The project is being carried out in his private capacity. The Matahari condominium units are 40 ft wide, which is about two normal linkhouses, with large built-ups of more than 3,900 sq ft. The average floor-to-ceiling height of 13 ft (23 ft at its highest) provides natural lighting and cross-ventilation. The condominium units are sold partly furnished and with three parking bays, while the penthouses will have five parking lots each. The project is accessible via the Sprint Highway, with direct access to the North Klang Valley Expressway, via the Duta interchange; Federal Highway, via the Pantai Expressway; and Litrak Damansara-Puchong Highway, via the Penchala Link. KUALA LUMPUR: UEM Land Holdings Bhd has proposed to raise about RM970mil via a rights issue to repay its borrowings, pay for the acquisition of land in Cyberjaya and for property development and working capital purposes. In a filing with Bursa Malaysia yesterday, UEM Land said the issue price for the rights shares was expected to be fixed at a discount of at least 30% to the theoretical ex-rights price of its shares immediately before the price fixing date which would be determined and announced in due course. UEM Land intends to utilise RM633mil from the gross proceeds to repay a term loan owed by wholly-owned unit Bandar Nusajaya Development Sdn Bhd and RM266.2mil for property development. Managing director and chief executive officer Wan Abdullah Wan Ibrahim said the proposed rights issue would allow the company to raise funds to repay its borrowings and reduce its interest cost which would lead to a more robust capital structure. “The inflow of capital for our property development activities will accelerate the realisation of value from our Nusajaya land bank and spur UEM Land’s future earnings growth,” he said, adding that the company had a number of property projects in the pipeline. “We are also optimistic that for 2010, the overall property market in Malaysia will outperform 2009 – particularly for Johor where we expect a lot of excitement arising from the successful implementation of Iskandar Malaysia’s initiatives and the spillover demand from Singapore with the recovery of Singapore’s property market and the opening of the Marina Bay Sands and Resorts World Sentosa,” Wan Abdullah said. Subject to all approvals being obtained, the proposed rights issue is expected to be completed by April 30. As at Dec 31, UEM Group held directly 1.87 billion UEM Land shares, representing 77.14% equity interest. Pursuant to the UEM Group undertaking, UEM Group’s minimum subscription amount will be about RM748.2mil. DUBAI: Dubai’s housing rout sent prices down 52% in the past year, prompting some homeowners to abandon their cars and mortgage payments and flee the country. Not one received a foreclosure notice. Barclays Plc won the sheikdom’s first foreclosure cases in court, clearing the way for lenders holding about US$16bil of Dubai home loans to take action when borrowers don’t pay. Islamic lender Tamweel PJSC, the emirate’s biggest mortgage bank, has several of its own foreclosure claims pending and estimates about 3% of its mortgages are in default. The successful foreclosures by Barclays may open the floodgates in Dubai’s property market, which went from the world’s best in 2008 to the worst after credit dried up and speculators who had fuelled price increases left the market, according to Deutsche Bank AG. Moody’s estimated in September that 12% of the 27,000 residential mortgages in the sheikdom would default within 12 to 18 months. Banks and developers until now have avoided the process of reclaiming homes through the courts, barred by tradition and an arcane legal process that few understood. The Barclays and Tamweel cases may change that, because they show that a 2008 mortgage law – setting out rules for default, foreclosure and repossession – is working. The law requires lenders to give homeowners 30-day notice of their intent to pursue a foreclosure, said Jody Waugh, a partner at law firm Al Tamimi & Co in Dubai. Courts then review the case and can issue a debt judgment that turns the property over to Dubai’s Land Department for auction. Waugh estimates the process may take two to four months. Barclays, Britain’s second-largest bank, said in an e-mailed reply to questions that it won the foreclosure orders, without providing details of the cases. The ruling showed that Dubai’s market was “evolving and is poised to come at par with other mature markets of the world,” the bank said. Both lenders and developers in the United Arab Emirates have tried to stem rising defaults through out-ofcourt settlements with distressed customers after falling prices left buyers with mortgages worth more than their properties. That has helped minimise the amount of bad debt on their balance sheets and kept repossessed houses off a market that’s already suffering from too much supply. Provisions for bad loans in the UAE surged 68% by to 32 billion dirhams (US$8.7bil) as of November, compared with a year earlier. Before the mortgage law was passed, lenders and builders could resort to the courts to enforce contracts, though they didn’t have the right to foreclose. Tamweel’s pending cases, filed almost two months ago, involve homes abandoned by owners who left Dubai at the onset of the global financial crisis, chief executive officer Wasim Saifi said. Tamweel’s default rate has been “hovering between 2.5% and 4% for the past six months,” he said. As alternatives to foreclosures, lenders in Dubai have extended payment periods and developers allowed customers with several properties to return some of them. KL PLAZA, one of Kuala Lumpur's oldest shopping centres on Jalan Bukit Bintang, will undergo over RM100 million facelift and be renamed "fahrenheit 88". Slated for opening on August 8 this year, the owners of the 511,000 sq ft mall are confident of the performance of fahrenheit 88, which will be positioned as a trendy lifestyle shopping complex offering affordable luxury. The mall is owned by Makna Mujur Sdn Bhd, which is owned by Pavilion International Development Fund Ltd. The principal of this fund is Qatar Investment Authority (QIA). QIA also owns 49 per cent of the Pavilion KL shopping mall nearby. KL Plaza was acquired by Makna Mujur for RM470 million and is being developed by Kuala Lumpur Pavilion Sdn Bhd. "fahrenheit 88 is set to be an iconic shopping destination that will enhance the retail scene along Jalan Bukit Bintang," Makna Mujur's director Datuk Lee Tuck Fook said. He added that it has thus far received "pretty good" tenancy and expects full occupancy before it opens in August. When asked about the expected return on investment, Lee said: "It is a long-term holding. We are not particular about how long it will take... (But) are confident about the investment here. We can always, build a mall, but we cannot replicate the location." In fact, the mall is adding a new entrance from Jalan Imbi. As such, its strategic location on Jalan Bukit Bintang as well as the new access from Jalan Imbi are expected to lure an annual visitorship of between 24 million and 36 million to fahrenheit 88. The mall will undergo a total change from its original look, with the addition of a skylight. Lee also said that Pavilion International is constantly on the look out for more retail mall investments and is in talks with malls both locally and abroad. However, none is close to signing. KUALA LUMPUR: Makna Mujur Sdn Bhd is investing more than RM100mil to refurbish KL Plaza which, upon completion, will be known as Fahrenheit 88. Director Datuk Lee Tuck Fook said the move was aimed at transforming KL Plaza into the hottest shopping mall in the Golden Triangle. Fahrenheit 88 would open for business on Aug 8, he told reporters after unveiling KL Plaza’s new logo yesterday. Makna Mujur is the owner of KL Plaza. Lee said Fahrenheit 88 would consist of 300,000 sq ft of lettable space spread over five levels of zoned shopping space. “The new and improved mall structure will feature special highlights such as a new sleek glass facade which allows for the sky light to illuminate the concourse, lending to a spacious and modern ambience,” he said. A trendy lifestyle mall, targeting both local and foreign urbanites, Fahrenheit 88 would consist of 280 retail shops offering the hippest fashions, in-vogue technology gadgets and the trendiest food and beverage outlets. NATURALLY endowed with forest, Kuala Lumpur has always been a garden city - an identity that few cities in the world can claim. This unique identity must be preserved and enhanced. Any city in the world can have manicured and landscaped gardens but none has the natural tropical urban forest designed and built by Mother Nature. Those who are familiar with some of these patches of forest especially in Sungai Penchala, Bukit Tunku, Bukit Damansara, Bukit Kiara, Taman Tun Dr Ismail, Federal Hill and Bukit Nenas are often surprised by the rich biodiversity of these areas. From the primitive fungi to the more developed small mammals, our urban forest is full of surprises. A system linking the small urban forests (as part of the green network plan) will further enhance their value. With some management, these areas will be the pride of Kuala Lumpur and this is what will make it different (creating a particular city and image). More importantly, these urban forests will improve the quality of life for the city’s denizens. Other cities in Malaysia can emulate Kuala Lumpur in creating urban forest parks and making them an emblem for Malaysian cities. Since most of the green areas are government land, they should be immediately gazetted as permanent Urban Forest Parks (UFP) while the privately-owned land be allowed to develop as low-density residential or commercial areas. Even better if the Federal Government could acquire some of the privately-owned urban forests and add on to the UFP. Notices of development projects are popping up everywhere at the expense of the urban forests but it is not too late for the authorities to take appropriate action to keep these urban forests intact. The three forest reserves — Bukit Nenas, Bukit Sungai Puteh and Sungai Besi together with patches of agricultural areas make up less than 0.07% of the land use in the territory. It will be great in the spirit of the KL Structure Plan 2020 — which pledged to give emphasis on social and environmental development — to preserve at least 1% as UFP for posterity. Trying to make Kuala Lumpur outstanding by constructing tall buildings and other man-made infrastructure will only be temporary. Some other city in the world will outdo Kuala Lumpur in mega structures the next day, but a city adorned with natural forest gardens is an identity that lasts. The city UFP will be a major selling point for tourism and contribute to quality living for urbanites. The Emkay Group has been awarded the coveted Brand Laureate Award, touted as the "Grammy Awards for branding" in the SME's Chapter Awards 2009, under the Property Development Preferred Brand. Founded by Tan Sri Mustapha Kamal Abu Bakar 26 years ago, Emkay Group has over the years accumulated notable success stories in the Malaysian property industry scene with MK Land Holdings Bhd as its public-listed arm. To date, under the public-listed arm, some 43,000 units of residential, commercial and resort properties have been built over its 2,835ha of land in strategic locations such as Damansara Damai, Bandar Baru Sungai Buloh, Damansara Perdana, Cyberjaya and prominent resorts such as Bukit Merah Laketown Resort, Langkawi Lagoon Resort and Taiping Golf Resort which amounts to a total GDV of RM 5.3 billion. The current projects under the Emkay Group which is the private entity under Mustapha Kamal includes NeoDamansara in Damansara Perdana, MKN Embassy Techzone and NeoCyber in Cyberjaya and Belum Rainforest Resort in Pulau Banding, Gerik, Perak. Recently the group ventured into the international market through a joint venture in Bangalore, India, with the Embassy Group of India to develop affordable homes on a 121.5ha land. SUTERA Harbour Resort has denied that its property in Kota Kinabalu is up for sale. "Sutera Harbour Resort is not up for sale. As president of the resort, I assure all stakeholders that there is no intention to sell the resort," Datuk Edward Ong Han Nam said. Business Times had reported yesterday that the resort was up for sale for RM1.5 billion, quoting sources. Sutera Harbour Resort was asked about the story, but it did not deny this.